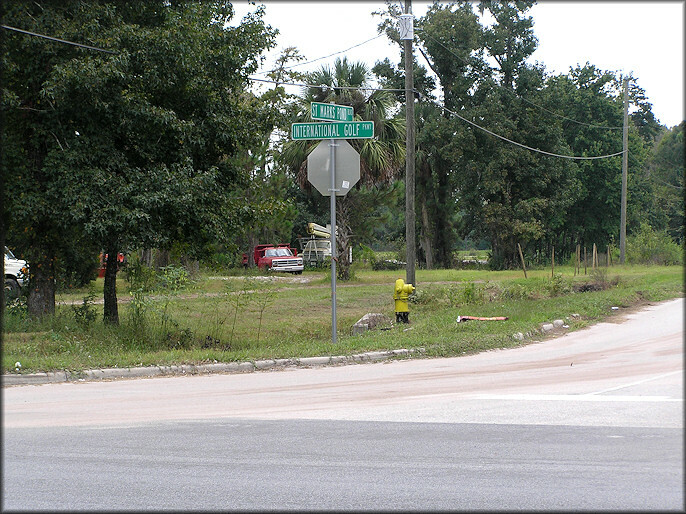 While surveying locations in northern St. Johns County for Daedalochila auriculata (Say, 1818) [Ocala Liptooth] on 10/3/2009, this reporter visited the intersection of St. Marks Pond Boulevard and International Golf Parkway (also known as Nine Mile Road) [GPS: 30.00261N 081.24153W - WGS-84 Datum], where the habitat appeared suitable for Daedalochila. Much to his surprise, specimens of Daedalochila uvulifera (both living specimens and empty shells) were found representing the first known instance of this species being recorded from St. Johns County and northeast Florida. (see: Daedalochila uvulifera Records For Florida). Specimens of Daedalochila auriculata were also found (see: Daedalochila auriculata at Twelve Mile Swamp). Several follow-up visits were made to the site and on each occasion additional D. uvulifera (both living specimens and empty shells) were found in the roadside swale both along the south side of International Golf Parkway and the east side of St. Marks Pond Boulevard in a relatively small area near the corner (pictured below). During a follow-up visit on 10/11/2009 the roadside swale on the west side of St. Marks Pond Boulevard was initially surveyed and two living D. uvulifera were found there as well. Preserved specimens from this locality were provided to the Florida Museum of Natural History (Gainesville, Florida) for further study.